Yet another vague 6-player start, followed by a veto of I'm the Boss by me, and we were off playing Cluzzle. I have nothing against the game, but it's always a bad sign to start off a game night with a filler or a party game. I tend to choose the hardest thing on my card so it's unguessable in the first round no matter how good a job I do. I chose "park" and built a bench and a tree. The bench was just a 3-sided blob, and the tree looked like a mushroom cloud, but it was guessed in round 3. After about 45 minutes, we were only about half way through, and 2 more players arrived, so we called it quits. Next came Factory Fun, the first time for 3 of us in this 4-player game. The game is nicely designed--physically and play-wise. The optimization of your machines, tanks, and pipes is quite an interesting puzzle, though perhaps it would be more fun as a web flash game. I disliked the part of the game where you have to quickly choose which machine to grab. Sure, you can make a partially-informed guess as to what you need, but the coupling of quick-draw intuition followed by careful mental calculation makes for an uneven tempo. I think I would prefer bidding for the tiles, so I could decide what I really needed and how badly I wanted it. But, of course, that would take away the "Fun" and who wants to play "Factory". That being said, it's good enough to give it another chance. At this point, I think everyone was ready for something meatier. I managed to get Perikles on the table and setup once again. Would we actually play this time? Sort of. It was the first time for everyone, but I managed to teach it with almost no peeks at the manual. I decided that rather than teaching every detail of the entire game up front that we would play each phase one at a time and I would explain just enough to get through it. Still, it took 30 minutes to get started. I went all out to get Sparta, hoping to grab one other city if possible, but it didn't happen. 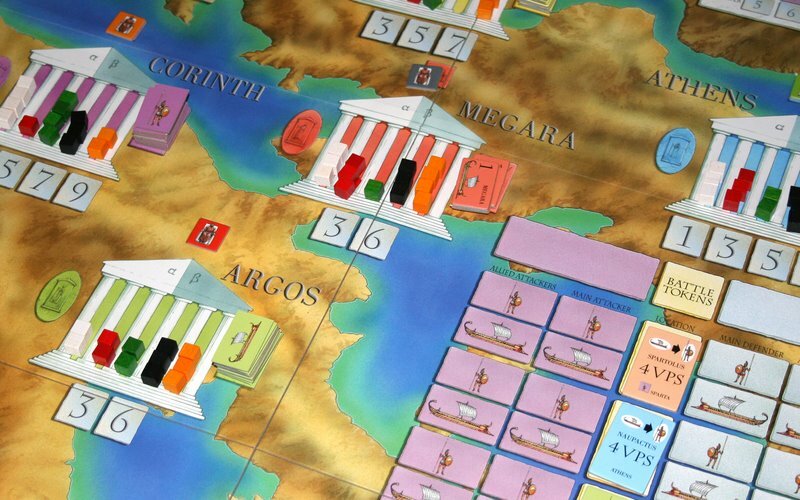 Another player got Athens and Corinth, but had to deal with 4 battles this turn while I had only 1. I chose the player to my left to start the round placing military units so I could go last. This was a miscalculation. Because of the distribution of 1- and 2-shard tiles, the player to my left actually played last. I defended Sparta in its single battle, and attacked 2 other cities. There were no allied units played. My defense was unchallenged--only netting me 2 cubes--but my 2 attacks failed. Sparta lost 4 major units in the first round. I quite liked the simple CRT combat system with the single or double staged battles. There's just enough randomness that you never know what's going to happen, and the game is always different. After 2 hours, we decided that we didn't have time to finish the game, so called it quits. I didn't get a good read on the other players. I think they were somewhat overwhelmed by the complexity. I really liked it...so far. I'll have to play a full game to be able to judge the inter-round continuity, which Perikles has in spades. Winning leaders lose support--possibly all of it. Defeated forces lose units, which may or may not be under your control again in the next round. Based on players' influence and past leaders (statues) in the cities, players may have conflicting attitudes about each city. This is definitely one sweet and juicy treat. I closed the night out by teaching PÜNCT. I find that I prefer ZÈRTZ more and more because of the faster play.